Whey protein is a popular supplement that can increase your daily protein intake without packing on too many calories. Adults often use whey for a protein boost, though children can use it as well. Provided your toddler is not allergic to milk or milk-based products, he can tolerate whey protein powder. However, supplemental protein for toddlers usually isn't necessary. Before giving your toddler supplements, be sure to consult with his doctor. If your toddler needs extra protein due to poor appetite or a health issue, whey protein is usually a safe source. But speak with your child's pediatrician before adding extra protein to her diet. Whey protein powder is a milk-based protein supplement. The National Dairy Council refers to whey protein as a complete protein, meaning that it contains all of the essential building blocks of protein. These building blocks are called amino acids. Essential amino acids are those that the body cannot make on its own and must come from the diet. In addition to being a rich source of protein, whey protein powder is also easy to digest, making it an appealing addition to many foods. 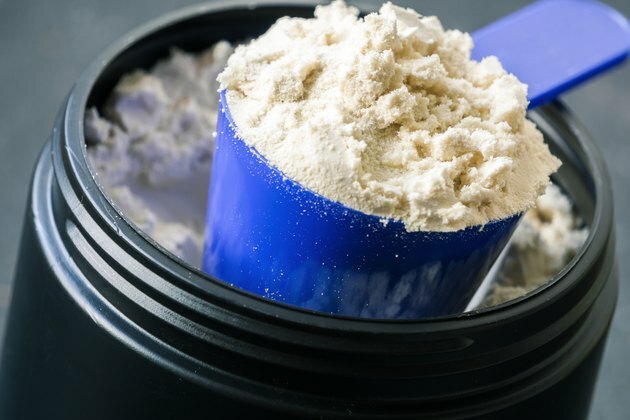 Read more: Is Whey Protein Good or Bad? Whey protein is safe for most people. Whey protein for kids is usually safe too, but not all can tolerate it. Those who are <ahref="https: www.livestrong.com="" article="" 19450-signs-symptoms-dairy-intolerance="" "=""> </ahref="https:>lactose intolerant, for example, may have digestive issues after ingesting whey protein powder. These reactions may range from serious to simply uncomfortable. According to Dr. Ari Brown, pediatrician and coauthor of the popular reference book Toddler 411, children are seldom born with lactose intolerance, but a number of population groups are more prone to developing it, including African-Americans, Mexican-Americans, Native Americans and Asian-Americans. If your toddler is allergic to whey protein powder, he will likely experience digestive upset, including diarrhea, similar to that suffered by someone who is lactose intolerant. However, a more serious allergy could cause hives, swelling of the lips or anaphylaxis — a serious, life-threatening reaction that constricts the airway passages. Whey protein powder is highly versatile. Because it is a powder, you can add it to many foods without significantly altering their taste. For instance, you can add a scoop of whey protein powder to a fruit smoothie, which may appeal to your child more than a protein-packed glass of milk. You can also sprinkle protein powder over soft foods like applesauce or yogurt, or add some to your child's pancake or waffle mix, soup, oatmeal or mashed potatoes. Toddlers are notoriously picky eaters; however, most get enough nutrition even from the small amounts of food they eat. In general, provided your child is gaining weight on a healthy curve and does not have any major health problems, such as a metabolic condition, the odds of her needing a protein supplement are slim. Kids need about 0.5 gram for each pound they weigh, according to KidsHealth. This means that if your toddler weighs 26 pounds, for example, he should be getting around 13 grams of protein daily. If you still wish to offer him a protein supplement, keep in mind that too much protein may be dangerous for your child, according to the Cleveland Clinic.